#1 is very broad and so has been and will continue to be covered by other blog entries. This entry will specifically deal with improvements to the dashboarding experience: numbers 2 and 3. In SharePoint 2010, we got rid of this model and made our scrolling work just like you’d expect: like Excel’s. The paging buttons are no more, and since the grid isn’t rendered in ‘pages’ anymore, the associated web part properties have also been removed. In the EWA in SharePoint 2010, you can scroll around your entire used range (and beyond) quickly and easily, whether your range is ten rows or a million. Additionally, due to how scrolling has been implemented, the size of the range of data you want to display in the EWA has no impact on the amount of time the page takes to load. The EWA always just renders what it is you are actually looking at in order to keep loading and rendering times to a minimum. In SharePoint 2010, because of the new AJAX grid, we’ve removed the need to even have to make this decision. Web part page authors can still decide if they want the EWA to periodically refresh data at all, but if they choose to allow it they’ll find that there is no more web part property to choose whether or not to notify the user. This is because in SharePoint 2010, the EWA can refresh external data in the background just like the Excel client. So, whenever it’s time for new data to be fetched, it will just appear on screen without affecting the user’s workflow or asking them to make a choice. It’s all automatic and seamless, just like it was intended to be. One of the most requested features for the EWA in SharePoint 2007 was to let users type into the grid. Parameters, while good for some things, aren’t ideal when users need to enter many values or when the spreadsheet is authored in a way that encourages users to enter data into specific regions. So, for 2010, we’ve added this capability as well. If the Office Web Apps are installed, you’ll see a new web part property in the Excel Web Access web part tool pane called ‘Typing and formula entry’. When selected, users will be able to type and enter formulas directly in the EWA. This functionality allows for the creation of rich, interactive, what-if models using the EWA, and just like before, these changes are per-user, and will never affect the underlying workbook. While we’ve kept the rendering just as good (and in many cases made it better) as in SharePoint 2007, we’ve done a lot of work this release to really make the overall experience of using the EWA more familiar, while at the same time opening up new scenarios that simply weren’t possible before. 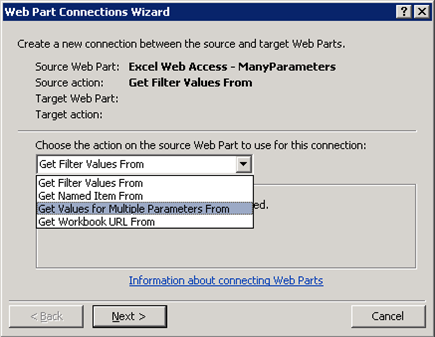 In SharePoint 2007, the EWA could connect with virtually all SharePoint web parts (as well as custom built web parts) using the IFilterValues web part interface. This worked great in many scenarios, as this interface allows a web part to send a value (or set of values) into a single parameter in the EWA. However, we frequently got asked if there was any way to send multiple values from a single web part into multiple parameters in the EWA, and the answer was unfortunately no. In SharePoint 2010, we’ve removed this limitation by supporting the IWebPartParameters interface. This interface is also supported by virtually all SharePoint web parts, and is also documented on MSDN to allow for customers to build their own web parts using it as well. 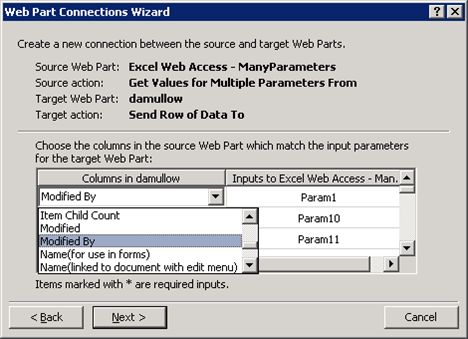 This interface allows one web part to send multiple values into multiple parameters in the EWA. Remember that in order for the EWA to accept values, you must first define parameters. See the Using Parameters In Dashboards blog entry for details on how to do that. 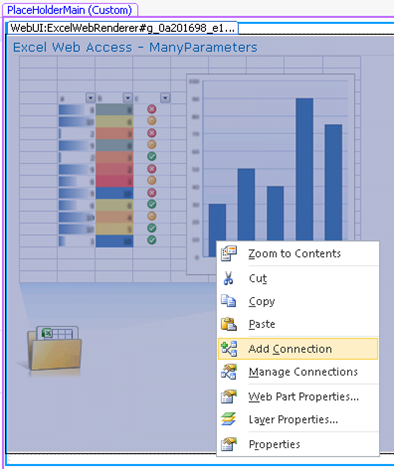 As you can see, we’ve greatly expanded the capabilities of the Excel Web Access web part in SharePoint 2010. It’s now easier to use, more Excel-like in how it functions, and it opens up new dashboarding possibilities with its support for typing and its support for the IWebPartParameters interface. 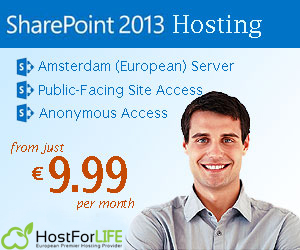 If you’re looking for cheap SharePoint 2010 hosting located at Europe, please visit our site. Now, looking for cheap hosting is very easy. Many providers offer unlimited hosting, but sometimes it’s all just a promise. You better find a reliable hosting with an affordable price. All of that opportunity can be found on our hosting. We not only offer a promise, but we do what we promised. Print article This entry was posted by Derek Bierhoff on June 2, 2011 at 4:44 am, and is filed under European Sharepoint Hosting. Follow any responses to this post through RSS 2.0. Responses are currently closed, but you can trackback from your own site.